When subcontracting medical or optic injection molded components, do you carefully evaluate your molder’s validation process? If not, you accept the risks of higher levels of defects and scrap, an inefficient process, process failure, and non-compliance. Most molders offer validation — but not all molders offer the one approach that delivers a repeatable product for years to come. The technical approach of developing a reliable production process is decoupled molding with an extensive validation protocol. This approach works by controlling the impact of variables to produce quality parts at the highest efficiency and repeatability. Without this approach, your process is not based on scientific data to support a robust process. It will not be optimized for the long run, likely resulting in more defects and higher costs. The goal of validation is to define an injection molding process that reliably produces parts to meet your stringent specifications. This upfront investment helps you and your molder understand how to produce quality parts consistently and most efficiently. When validation is properly done, not only will the process result in parts that meet your specification on day one, but the parts will consistently meet the same specifications for the long-term. Said another way, the process will not drift over time. 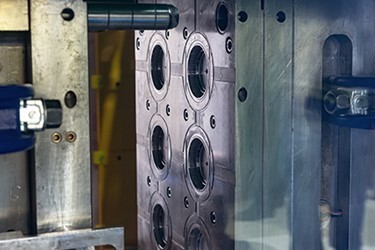 Industry trends such as automation, miniaturization, increasing stringency of customer requirements, and high cavitation molds are driving the need for process consistency. Here’s why. Automation — Automated processes are vulnerable to even the slightest dimensional changes. A small change in the size of a part can stop the automation, introduce the need for human intervention, and even require a line shut down until the parts are within specification. The scientific decoupled method of validation prevents this from happening by accounting for the major variables that impact the process. For instance, variability between lots of material or slight changes in room temperature during production can be factored into the process so the normal variation in those parameters will not impact the dimensions once production begins. By contrast, an unscientific approach to validation does not account for such expected variation. Thus, while a process may meet dimensional requirements at a point in time, variability in the process may cause dimensions to shift over time. That is the risk you accept with the unscientific approach. Miniaturization — Miniaturization is driving the need for tighter tolerances and greater dimensional concerns. For example, dimensional tolerances can be tighter for a part going into an assembly with a tighter fit. The scientific decoupled approach helps you understand what important variables drive the changes in the part and how it can be made with more consistency and repeatability. Customer requirements — Customer and regulatory requirements for medical devices continue to become more stringent to ensure end user safety. Validation plays an important role in vetting out production challenges and reducing defects and risk. High Cavitation — Finally, the high cavitation molds often used for medical devices can be a challenge when trying to achieve capability of critical dimensions. Validation provides the appropriate testing to identify the optimal process. To fully appreciate the importance of scientific decoupled validation protocol, first let’s dispel some common misunderstandings. 1. What is the true cost of inadequate validation? It’s easy to underappreciate rigorous validation if you believe the cost is limited to the occasional bad part or shipment of parts -- but that is not the whole story. When a bad part shuts down an automated process, you also have the costs of downtime, lost production, and troubleshooting time. Even worse, when a bad part is incorporated into an assembly or filled with an assay prior to discovery of the defect, the waste is significantly higher than the cost of the bad part alone. A strong validation protocol allows the molder to encounter and fix issues during the validation phase, preventing many issues during production. When a dimensional issue is encountered during validation, it gets worked out before production begins. 2. Are you asking your molder the right questions? When learning about a molder’s validation process, don’t just ask if they validate. This should not be a yes or no question. Dig deeper to understand how their validation process works. Here’s why: you can present the same specifications or requirements to two different molders and the validation protocols can be significantly different. Even though both molders can meet your specifications or requirements, the more important question is whether they do it for the long run without drifting out of control. Furthermore, will your process be optimized? Though they meet your specifications or requirements today, is your cycle time optimized? What is their Cpk standard? Is scrap optimized? Is their measurement system repeatable and reliable? 3. Are Cpk values important? Do not overlook your molder’s standard capability measure, or Cpk. This is a very important aspect of the validation process. Cpk describes the process capability of meeting a tolerance for specific dimensions. Each dimension that is measured has its own capability result. Capability index is based on individual measures of a controlled process, and predicts the probability of individual measurements conforming to the specifications in the future. As a customer, you definitely do want to know what Cpk your subcontractor can deliver because it tells you the probability of a defect. A Cpk value of 1.33 is a rigorous but achievable standard. When a process is validated to a Cpk of 1.33, it is expected that only 32 parts per million will fall out of specification for that specific critical quality dimension. Cpk tells you if the process produces parts consistently within specification. Although a sub-contractor meets the Cpk standard today, that does not guarantee they will be able to meet that standard over time -- unless the scientific decoupled approach is used to develop a process window using design of experiment (DOE) studies. Without a justifiable process window, the impact of injection molding parameters to dimensions is unknown. When a process window is established it can be assumed that the process is much more reliable. 4. Do you assume your subcontractor’s measurements systems are accurate? A common assumption is that all measurement systems are accurate. In fact, false measurement systems are a significant industry problem. Variation within a measurement system can distort the Cpk results and cause false rejects and false acceptances. How do you know the measurements of your subcontractor are accurate? The validation protocol needs to include a measurement system analysis (MSA) or a gage repeatability and reproducibility (gage R&R) study. Calibration alone is not enough. Many companies are unaware of gage R&R studies which confirm the contractor can achieve consistent measures from part to part, and operator to operator. Validation is the appropriate time for a subcontractor to vet out the repeatability and reproducibility of the measurement equipment results to ensure accurate measurements, time after time, part after part. Calipers, a traditional measurement system, are inadequate for precision measurements. They can be highly prone to error, especially as measurements become smaller, such as one thousandth of an inch (0.001 inch) and smaller. Some modern measurement systems, such as a coordinate-measuring machine (CMM), are automated. These systems use an optical touch probe to measure parts with high accuracy. Validation proves that the measurement is repeatable and reproducible. Building an adequate fixture is a common method to ensure parts sit in the exact same place every single time you place them on the measurement system. When fixturing is used, your automated CMMs know where to look for the parts, improving repeatability. Precision measurement tools are increasingly important with today’s tighter tolerances and dimensions. Be sure to ask for clarification of your subcontractor’s measurement systems. Ask for an MSA or gage R&R, to ensure you are getting accurate results. 5. Do you undervalue technical strength of your subcontractor’s workforces? Innovative problem-solving is required to create the most efficient injection molding process and achieve best results. This requires a highly technical workforce, supported by highly technical leadership. The ideal workforce will include plastics engineers, master molder certifications, Lean Six Sigma black belt training, etc. Engineering expertise at higher levels in the molder’s organization is important to ensure financial and resourcing decisions are made with technical requirements in mind. 6. Do you perceive validation as costly and time-consuming? Strong validation protocol may have a higher upfront cost and require extra development time. However, it is important to recognize the long-term value of scientific validation. This technical approach to validation results in fewer defects, less scrap, less downtime, and a more efficient process including an optimized cycle time. The alternative, a quick start-up with more defects and scrap, downtime, and an inefficient process is costlier and less productive in the long run. WHAT IS THE DECOUPLED MOLDING APPROACH? Decoupled molding begins with assigning equipment that will work the best on the product you are validating. Machine clamp tonnage, available speed, and available pressure will come into play and need to be analyzed before beginning any validation protocols. From there, decoupled molding paired with process optimization is used to develop an acceptable process. Temperature, flow, pressure, and cooling are all investigated to determine what factors have the most impact on the process. Next, software such as Minitab can calculate the process window that will produce acceptable product given the significant parameters. When operating within the validated process window there is confidence that your product will stay dimensionally stable. While attribute issues may surface during production, they are documented through the validation process in the standard operating procedures. If an attribute problem occurs during manufacturing, the history and documentation will explain how to correct the issue. IQ (installation qualification) — Documented evidence establishes the equipment has been properly installed and meets requirements, utilities meet the manufacturer's requirements, the work environment is adequate, gages are verified, and personnel involved in the qualification have been appropriately trained. Once approved by the customer, the site acceptance test is next. SAT (site acceptance test) — This is the initial trial run where the first shot of plastic goes into the mold at the subcontractor’s facility. The intent is to verify the asset (e.g., mold, automation) in question meets the user requirements and conforms to the approved design. Process optimization studies are utilized to verify each of the injection molding stages produces acceptable product time after time with a repeatable process. Once the appropriate standard settings are identified, dimensions and attributes are verified to be acceptable. Once the SAT is approved, operational qualification activities may begin. OQ (operational qualification) – At this stage, the process is challenged. The intent is to provide documented evidence that specific process settings, process control limits, and action levels result in product that meets all predefined requirements. The limits of specific process settings are tested using DOE studies to ensure settings and adjustment changes within production still result in acceptable products. Typically, six settings are chosen. Temperature, pressure, and time are among the processing conditions evaluated to see which has the most significant impact on the part. The DOE outcome provides predictions and knowledge when creating the process windows or process extremes that continue to result in acceptable product. These process windows are then verified within the operational qualification. DOE studies also help establish the fastest achievable process. As an example, you may have a tool that initially runs at a cycle time of 20 seconds, but after the DOE studies you determine the cycle time may be reduced to 16 seconds. You would not know that without pushing the boundaries of process development. Faster cycle time correlates to higher output, resulting in a lower part price. Once those windows are identified, the process is set at its nominal settings and run for a long duration. This is known as the PQ, or performance qualification. The PQ establishes through objective evidence that the process, under anticipated conditions, consistently produces a product which meets all predetermined requirements. Components produced during the PQ runs are manufactured, inspected, and measured by normal production staff. They are handled throughout as though they were normal production batches, resulting in sellable product. The performance qualification serves as the final validation milestone prior to running regular production. If your injection molded parts are not consistently meeting specifications, it is time to revisit your molder’s validation process. There is only one approach to validation that is proven to keep your molded parts “in spec” over time. Meeting specifications at one point in time is not enough. There are no shortcuts. As industry requirements become more challenging, the scientific decoupled validation approach is the only approach that will minimize costs once production begins and minimize defects over the long-term production of a part. Contact Carclo’s technical experts with your questions about medical or optic injection molding validation at sales@carclo-usa.com or 724-539-6989. Bob Emmett is a senior quality engineer at Carclo Technical Plastics. He is a graduate of Penn State Erie, the Behrend College, with a bachelor’s degree in plastics engineering technology. He holds a Lean Six Sigma Black Belt training certificate. Luke Lorson is a process engineer at Carclo Technical Plastics. He is a graduate of Penn College with an associate degree in plastics and polymer engineering technology. He holds a Master Molder 1 certificate.